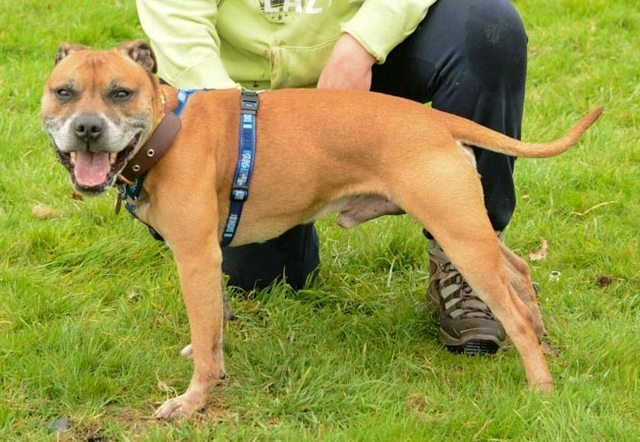 Blake is a 5 year old male Staffordshire Bull Terrier Cross. Blake needs a family who can offer him time to settle and he will have to gradually build up his tolerance of being left alone, part time working hours at most. Blake will need a secure garden 6′ panel type fencing and awareness in ensuring the front door/ back gate isn’t left open. 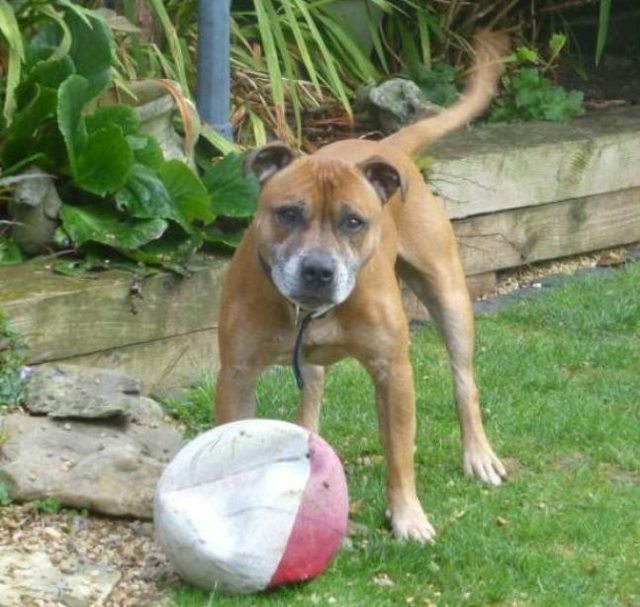 Blake has high joyful energy and needs an active family to be enabled to engage and have fun. Only pet and would prefer low dog density. Blake was found stray together with a staff pup thought be his son in Wales. Blake is now neutered, chipped and fully vaccinated. Blake is kennelled in boarding kennels near Godstone. Blake is a Footballer, demonstrating his dynamic energy combined with attention to his handler and key commands. He so want to please and dotes on his companionship. Blake is such a people dog, and improving dog skills. Easy to manage with his harness on. He needs a calm home where he will be walked and loved. He responds well when you correct him with your voice and looks up at you and falls into step by your side. He will look up at you every now and then for some reassurance and affection. Blake is great with heavy traffic, including passing lorries. 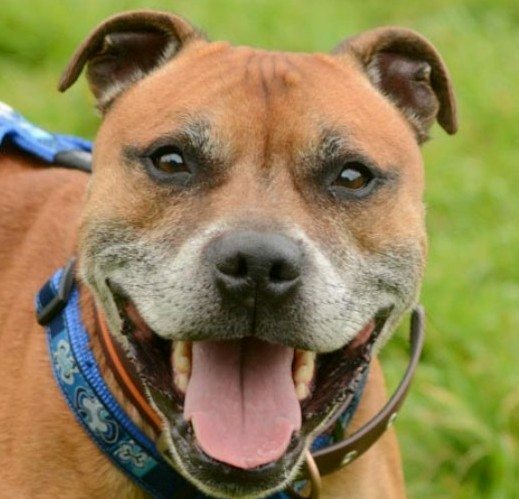 Blake needs a calm energy around him and he is a Blake is a 6 year old longer legged Staffie red in colour with a blackish muzzle which is greying. Bright eye and in very good health. Blake is a little desperate in kennels: The attention he craves is gentle loving and lots of activity to engage his active mind in. Away from the kennels Blake really settles and seems to dote on the peace and being with the one he loves. Handsome lad! Visit Blake’s thread for daily updates, lots of pictures and videos. Please click to submit Online Application We will match you with a dog that suits your lifestyle, please remain open we successfully home 350 dogs per annum. We work fast to secure our dogs their loving homes. Rescue Remedies (www.rescueremedies.co.uk) is an internet-based rescue that homes mainly to the South East of England. The Rescue will also consider homes further afield if adopters are willing to travel. Rescue Remedies aims to provide a safe and warm foster home for as many of their dogs as possible whilst they are waiting for their forever homes. 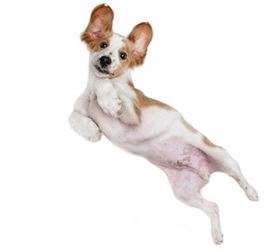 The Rescue also uses boarding kennels located in the Surrey, West Sussex, Hertfordshire, and Greater London areas. If you are interested in adopting a dog from Rescue Remedies, please complete their online homing questionnaire at: https://rescueremedies.wufoo.eu/forms/rescue-remedies-homing-questionnaire/ Rescue Remedies and its sister rescues (Staffie Rescue, Terrier Rescue, Patterdale Terrier Rescue, and American Bulldog Rescue) also run a Free Live Forum here: http://rescueremediesdogrescue.co.uk/ where you can read daily updates on their dogs available for adoption.